For the past twenty years, cubicles have started losing its popularity in most office spaces in the Philippines. What was originally created to be the ideal template for a “productive office floor plan” has begun losing popularity among the millennial demographic. 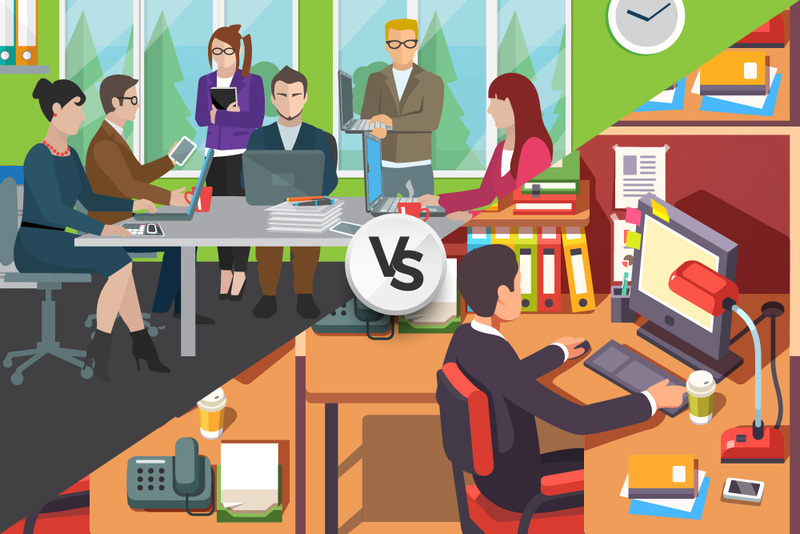 Recently, we’ve seen a rise on the popularity of the open office model due to how it beats the cubicle set up in terms of workplace synergy. Another benefit that we see in the open office set up is how it aims to enhance the ways staff collaborate. Recently, open offices and flexible workspaces have started gaining popularity even in the Philippines. In places like Makati and Ortigas, we have seen a sudden surge in demand for open work spaces. Open offices can actually save money. This is because it maximizes the floor space and lessens the need for furniture. More employees can be designated on the work floor in this type of set up as compared to a floor that has cubicles. A better sense of camaraderie and rapport can be achieved with open offices, along with how it fosters a culture of teamwork. The most vocal advocates of the open floor office are those who are involved in marketing and advertising as well as those from start-ups. However, not everyone is convinced about the benefits of an open floor. Some argue that privacy is compromised on a table shared by a group of people. People who are involved in handling sensitive information may prefer the privacy of having an enclosed work space. Personal data almost becomes quite common knowledge and might be seen by workmates one shares the space with. The absence of permanent workstations, people may feel some stress connected to privacy, with personal data trails within reach in the area you used. While teamwork among staff is strengthened, it is also its biggest downfall. Sometimes an illusion of productivity is created with open offices, where most of the biggest drawbacks are noise and the lack of personal space. Sometimes it becomes difficult to concentrate on work when some of the people you are working with is chatting freely. Another disadvantage with open office is that it doesn’t respect the idea that people have different ways of working with each other. The concept that one way of working is applicable to all is wrong. There should be a time allotted for concentration and a different time for collaboration and for the team to brainstorm. Despite the common known fact that cubicles offer little space and privacy, some argue that more privacy and space is lost in an open floor set up. This is due to the fact that in open offices, teams or groups are required to share tables and workspaces. Concentration is very much negatively affected, with only half of the staff affirming that they are able to concentrate with all the noise and the ruckus happening around them. The best remedy is to not give in to this false sense of job performance which according to studies can only be improved by having privacy. A recent study also shows that people are prone of getting sick in open work spaces. This is due to the fact that infection travels fast in places where people are grouped together. While the popularity of redesigning office spaces from cubicles to a more open floor plan, not every one is convinced and would like to hop in on the trend. Though open offices may offer a new concept of teamwork and camaraderie, the cubicle will, as much as we try to demonize it, be here to stay.